Johann Winkelhofer and Richard Jaenicke had a small workshop in Schoenau near Chemnits (Germany) where they repaired bicycles. Several years later they built their own bicycles, motorcycles and typewriters (as the make Continental). In 1905, they built their first car. However, the car had so many technical problems that it took until 1907 before a second prototype could be built. This car was also far from reliable. Only in 1912, were most of the problems solved and could production start. The two Germans were offered a design by Ettore Bugatti, but they thought their own car was far more beautiful. The small Wanderer W1, also known as the Puppchen was a success. The W1 seated two grown-ups, one behind the other. The car was powered by a 1140 cc, four cylinder engine and because the car only weighed 500 kg (1100lb) it had a top speed of almost 44 mph (70 kph). 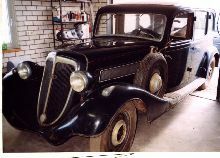 The model remained in production for almost fifteen years. The most important modification was moving the seats. From 1913 onwards, the passenger seat was staggered behind the driver's. In 1928, the W 10 was launched which had a 2.0 litre engine and in 1929, followed the large and more expensive W 11. The car was powered by a 2.5 litre, six-cylinder engine and cost the then astronomical sum of RM 8,000. 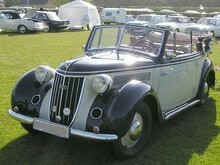 When the Auto Union was founded, Wanderer was put in charge of the medium-priced cars. The new board of directors had the relatively conservative bodywork modernised. Dr Ferdinand Porsche developed a compressor engine for a sports car the W 25 for Wanderer, but unfortunately the engine proved unreliable and that is why only 250 were sold. 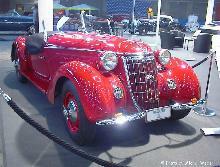 In 1937, the W 23 was launched, which had a 2640 cc, six cylinder engine. This model was to be built for the Wehrmacht until 1941. After the war, the Wanderer factory lay behind the Iron Curtain the production of cars was discontinued.